We are super proud of one of our Founders, John Davie, who recently received a Lifetime Achievement Award at the Music Teacher Awards 2019. 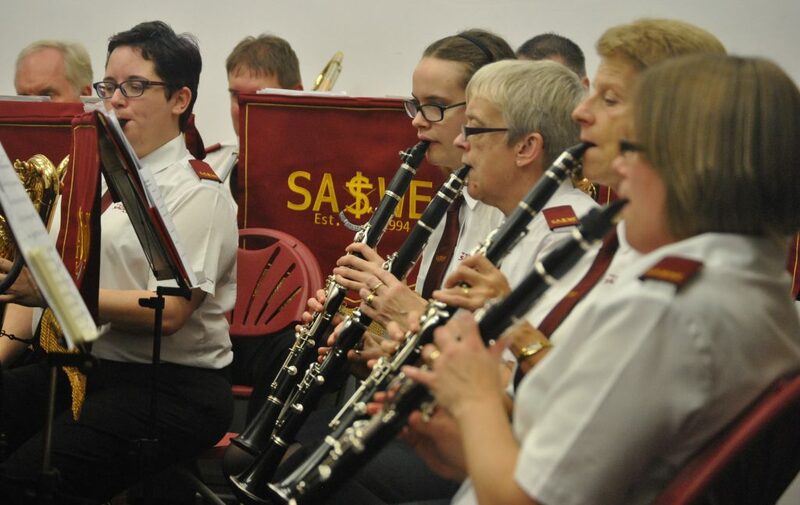 One of our long-time members, clarinettist Pam Murdoch, is running the London Marathon on 28th April 2019 and raising money for The Salvation Army Big Collection. If you’d like to donate and help motivate Pam, you can do so on her Justgiving page. 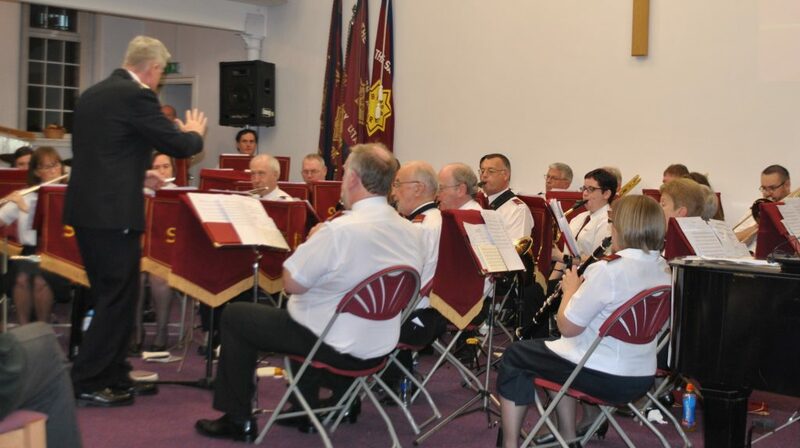 The welcome return visit of the Salvation Army Symphonic Wind Ensemble (SASWE) to WORTHING marked its own 25th anniversary and the 135th of the home corps band. As the opening piece stated, it was a ‘Cause for Celebration’. However, there was from the start no doubt that it was Jesus who was celebrated throughout the weekend. The Saturday evening festival was compered by the SASWE co-founder and bandmaster Andrew Mackereth in his inimitable user-friendly style. He had immediate rapport with the audience which included some who came simply because of a mention in the local paper. 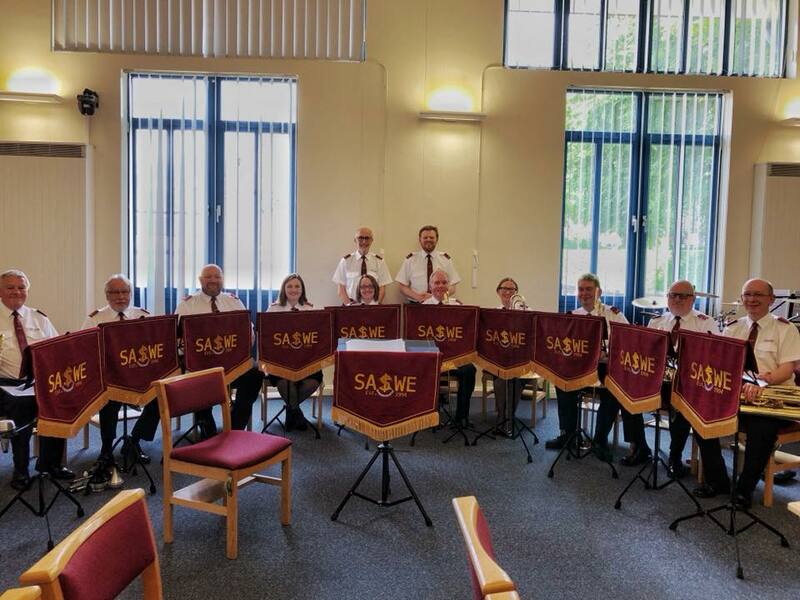 The music comprised compositions and arrangements by present and former SASWE members Alan Laken, Michael Babb, Kevin Horner and the bandmaster, and included thought-provoking reflection from flautist Lieutenant Kate Gregory and three gospel songs from the corps songsters. 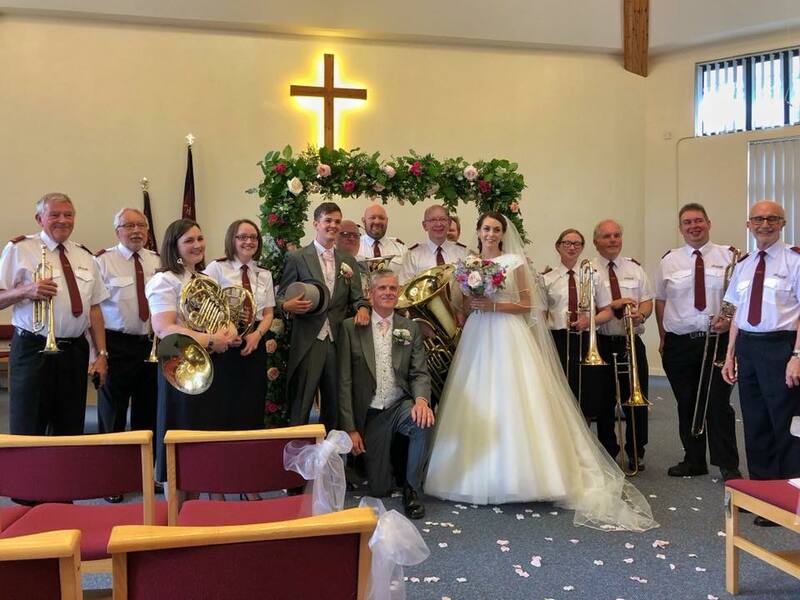 Five members of Worthing Band were among the SASWE instrumentalists – six if you include corps officer Major Marian Parker who sat in with the percussion on the Sunday. The morning worship took as its theme ‘There is Room’, the title of a new piece by Bandmaster Mackereth based on the song ‘Thou didst leave thy throne’. Percussionist Mark Hamilton and clarinettist Rachel Frost testified, and SASWE chaplain and saxophonist Peter Bale gave the Bible message. The band played again after the benediction, and when the bandmaster turned to the congregation with the remark ‘Do you want another?’ the immediate and enthusiastic response was evidence of the attractiveness and effectiveness of the SASWE mission. SASWE (Salvation Army Symphonic Wind Ensemble ) assembled in Bristol from all parts of the UK territory to help raise much needed funds for The Kenya Trust. Hosted by Bristol Easton the Saturday concert was presented at Staple Hill, due to renovations taking place in the host corps building. A full hall enjoyed a varied programme, compered in an amiable fashion by SASWE’s leader, Andrew Mackereth, supported by Bristol Easton Songsters. A highlight was both groups combining to perform Dry your tears Africa which gave a real flavour of the continent. Sunday morning worship was conducted by the group at Bristol Citadel where congregations from both Easton and Citadel combined, and were supported by the Citadel Songster Brigade. The week-end concluded with lunch in the Community Hall at Bristol Easton, for members of SASWE and their hosts. A group of SASWE members were honoured to play at the wedding of the year this summer. Thank you to Ellie and Josh for having us – it was a truly wonderful celebration of love and friendship and we were honoured to play a small part. Due to works taking place at Bristol Eastern Salvation Army, the venue for SASWE’s visit to Bristol for The Kenya Trust has changed. Rachel Frost is a Theology Student and is studying at Edinburgh University, and hails from Cambridgeshire. We asked her to put her first impressions of joining SASWE as a clarinet player into words. To say I was nervous about my first trip with the Salvation Army Symphonic Wind Ensemble is an understatement. I was still relatively new to the Salvation Army, having come to my local corps in Edinburgh as a student the previous year. This anxiety was centred mainly about a trip to Glasgow as, coming from Edinburgh, this was a place I was warned never to visit. None the less I stood waiting for my 6.30am train having been up for an hour pondering what else I was nervous about. The people were the next one, what would they be like? Would they be welcoming and friendly like at the Corps, or would they be a bit standoffish, especially given I was not a member? Then there was the music, I may have been a decent musician at school but that was compared to a limited number, how would I compare with the other musicians? Then there was the train travel, the drive to Shipley with two strangers, and a night Billeting with a couple who I had never met. However, I am very pleased to say that none of these worries were validated. The people were some of the friendliest I had ever met and immediately made me feel welcome, by the end of the day I felt like I known some for years such was the genuine nature of their friendship. The music was wonderful, tunes that I both knew and did not know intermingled within a program of general fun. Whilst I can’t deny I struggled with some of the runs and the pace of “Just like John” I played everything smiling inwardly and outwardly such was the skill in the arrangements. My Train travel and inaugural trip to Glasgow were both successful. The drive to the concert and the return were both fantastic fun, and taught me an awful lot of practical jokes to play on brass players! The couple I billeted were wonderful and I had the best breakfast of Pancakes that morning. All in all it was a great trip and reflected many of the themes that first led me to the Salvation Army. I now look forward to the next gig and the chance for further chat and fellowship (just nit when we are supposed to be rehearsing). I am a bit of an ecclesiastical all-sort, not really settling in a number of churches. I been a Methodist, Baptist, Church of England and had dabbled in the free church when I first came to university. All these churches had been good, but had not filled the fellowship category that I looked for in each new establishment. I had tried a couple of churches when I first came up to uni but none of them seemed to suit. I’d been emailed by the ‘Corps Officer’ (who I assumed was the leader, having never heard the term before) of the Salvation Army City Corps of Edinburgh and, as it was a 20 minute walk away from my halls, decided I’d go and have a look. The Corps immediately made me feel welcome, I felt taken into their family. The Corps are still, a year and a half later, a wonderful family. I have any number of adoptive parents and grandparents, as well as some siblings! The preaching and the music are all wonderful but what keeps me going back and what I miss when I can’t be there is the family. This is why I have chosen to stay in the Salvation Army, the fellowship and family element that they offer to all people. 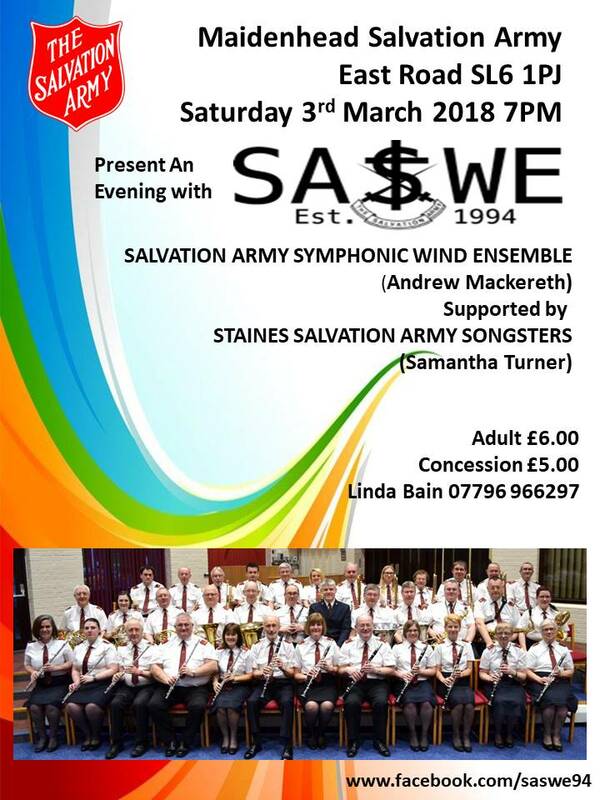 SASWE will be playing a festival of music at Maidenhead Salvation Army on Saturday 3rd March 2018. Hope to see you there! 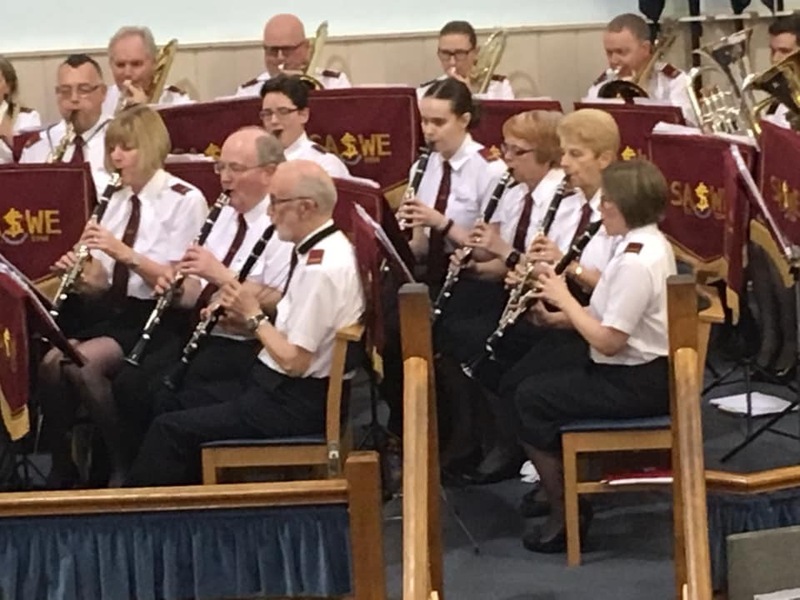 There was an air of purpose and anticipation as members of the Salvation Army Symphonic Wind Ensemble converged on Shipley on Saturday. Despite the majority of the band having travelled extensive distances, they were soon practising hard to put the finishing touches to their musical programme. Planning for the event had begun a couple of years earlier when an invitation was extended after hearing the playing and enjoying the ministry when the band visited Brighouse. As darkness fell and the audience began to gather, there was a renewing of friendships together with those coming to hear this unique group for the first time. Despite the nervousness about the very young baby right on the front row, it was clear from the very first notes that the capacity audience were in for an entertaining evening. The band, under the direction of Andrew Mackereth, provided an exciting and varied programme which offered something to appeal to everyone. From the opening celebration, ‘Réjouissance’ (A Laken) to the concluding challenge, ‘The Presence and the Power’ (A Mackereth), the music married excitement, precision and sensitivity. The evening included lots of audience participation. In addition to the congregational songs, everyone was invited to sing a long with Shipley Worship Group as they presented a ‘Spiritual Medley’ and ‘I will follow you’. There was also plenty of singing to the band pieces, although Barrie Hingley’s arrangement of ‘Marching to the Devil’s Tunes’ might not have seen everyone singing from the same hymnsheet. 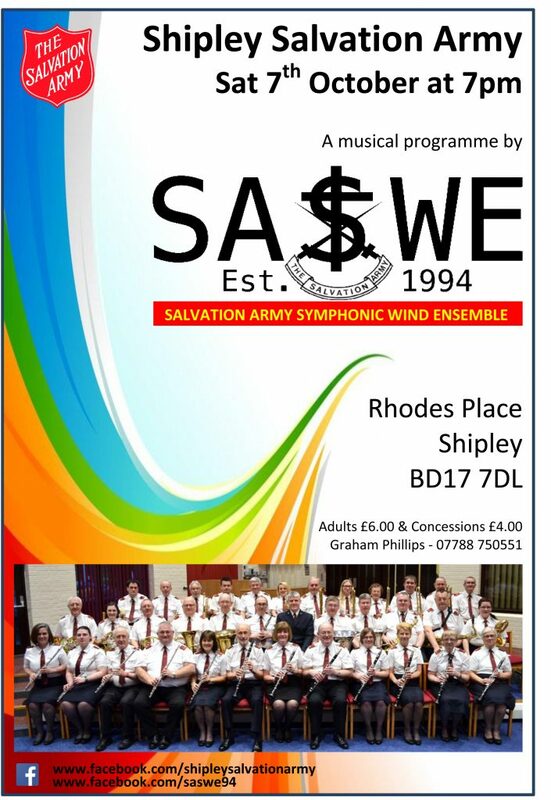 SASWE will be performing a musical programme at Shipley Salvation Army on Saturday 7th October 2017 at 7pm. 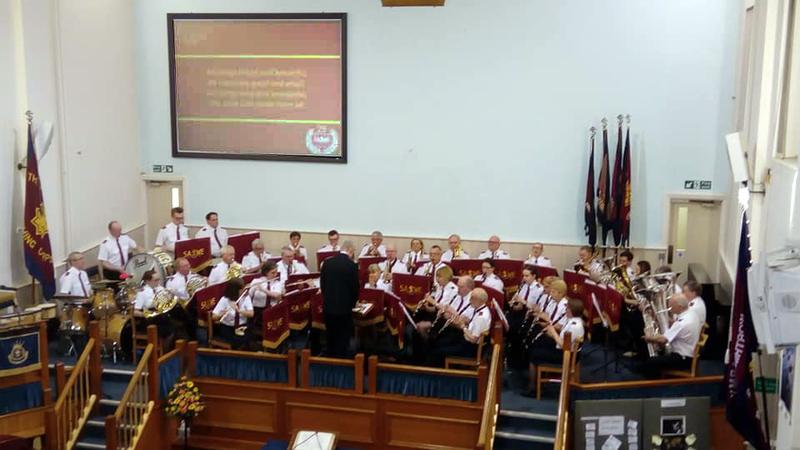 Saturday 2 and Sunday 3 March 2019 - Worthing Salvation Army, West Sussex, for the Band's 135th Anniversary Weekend.